Teriyaki good Pearl at large. It has decided luxury 3 grains Settings To Plump pearl reminiscent of the sea foam in the ear. Form of freshwater pearl, such as the potato. Something close to a semi-round that Judiciously Among them have been as much as possible to choose Otsukuri. Compared to the general potato ball, shine has much better. Carefully we have hand-rolled finished with 14k gold-filled wire. This time, because the good shine Pearl has entered the hand a lot in the large, We were able to reduce the cost. In town use, and dinner at the resort. . ※ bullion is silver type are also available. 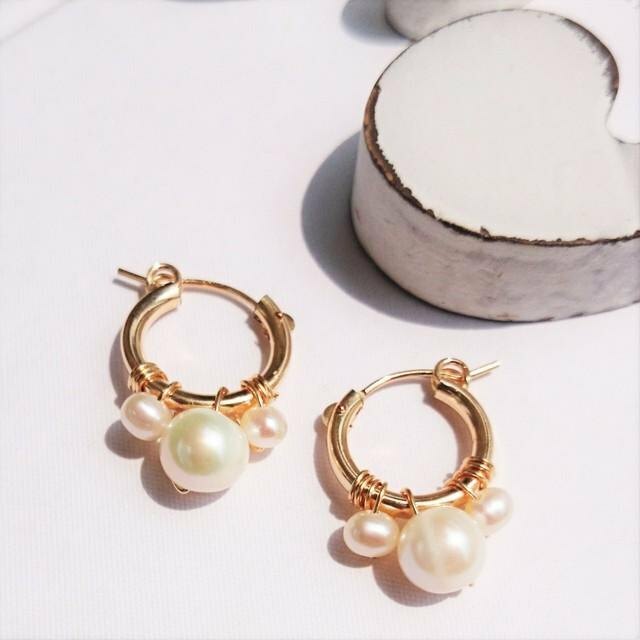 Stone / Freshwater Pearl (potato) Pierce bracket-wire / 14kgf gold filled Earrings / gold plated (gold plated) Hoop diameter / 15mm ※ The respective sizes are an aim. ※ The atmosphere of the color depends on the environment of the monitor that you use it, and it's sometimes seen. ※ When it's pulled hard for a handicraft, it breaks. Attentively, please handle it gently. ※ The difference in shipping charge is made the price of the packing material. Please understand. A producing center / production method A producing center: Japan Handmade.